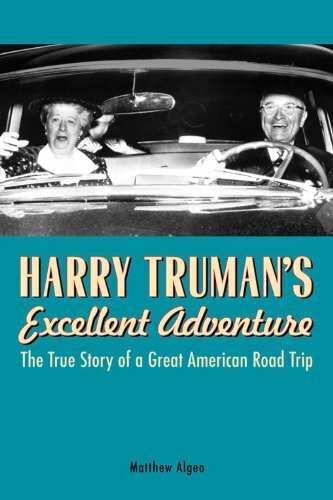 If you are of my general age, you are going to love “Harry Truman’s Excellent Adventure” by Matthew Algeo. If you are a lot younger than I, you need to read it to better understand why folks like me tend to get a little grumpy about how life in the USA has changed during our lifetimes. The book focuses on a 1953 road trip the former president and his wife took from their Independence, Missouri, home through Washington to New York and back. Algeo retraced their journey, following the same routes and staying in, eating at, and visiting as many of the same places as possible, describing what he saw and whom he met and commenting on political, historical, cultural, social, and economic issues of Truman’s time. President Truman was the last president to freely walk the streets of the nation’s capital both during and after his years as president, the last to leave office without any federal government pension or help with office expenses, and the last to leave without any Secret Service protection. Truman, on principle, also refused to profit from having served as President, never serving on boards or being paid for speeches or endorsements. He did lobby for federal financial support for ex-presidents and finally got Eisenhower’s support for such, just before Eisenhower became an ex-president. President Truman’s service was not without controversy. He was the man who said “yes” to bombing of Hiroshima and Nagasaki, and he took the US to an undeclared war in Korea. He was a Democrat, but a fiscal conservative and a strong advocate of US military strength, even opposing defense cuts his successor, Eisenhower, advocated. Truman left office with a 22% approval rating, about the same as that of George W. Bush. Issues and events explored in Algeo’s book include the American love affair with the automobile and development of the national highway system, the Cold War, the death of main street, race, segregation and the KKK, birth of television as a political tool, founding of the United Nations, the Iranian revolution, McCarthyism, and, for Sci-Fi fans, the “Roswell Incident.” Truman’s relationships with and opinions of presidents from Hoover to Nixon are included. Nostalgia stirred up by this book in children of the 1940’s will probably be matched by wonderment in the minds of their grandchildren. There are two big drivers that account for the changes: demographics and technology. The population has more than doubled since Truman served, and the melting pot concept has died in favor of some muddled concept of multiculturalism. And, in Truman’s day, everybody read the same news stories and watched the same news on TV. Now, few are reading news stories at all, and we are watching “reality shows” on TV. There is another difference. Harry Truman was a humble public servant who came into office poor, left just as poor, and died in pretty much the same condition, having netted less than $50,000 from the publication of his memoirs. That has not happened since and will not happen again. Thank you for sharing this, Darryl. I will definitely read the book now! Well said, Skeptical Oberver. Thanks for the lead. Right up my alley. A visit to the Truman Presidential library and home in Independence MO is well worth the trip. One anecdote I recall reading involved a question by a reporter after he and Bess arrived home by train after leaving the White House. “What was the first thing you did when you got home, Mr. President?” With a slightly puzzled look, Truman replied, ” Unpacked the suitcases and put them in the attic.” A simpler time, with a simple response by an honest and honorable man.